Pamela Wyn Shannon is a Massachusetts based guitar player who produces somewhat haunting laments, and mediaeval ballads. 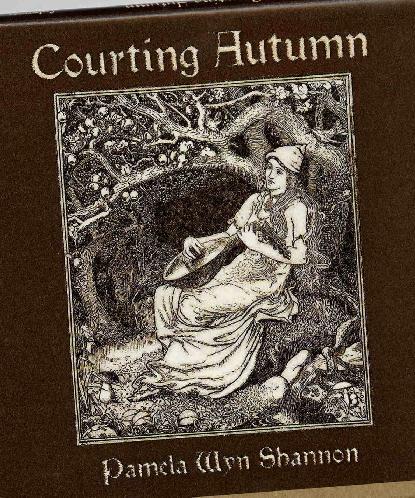 Courting Autumn is her latest release. As a full time folky, as well as space case, I was inspired to choose this CD, as Bert Jansch and Shirley Collins were both mentioned in the bio, and, not being naïve of their works, I needed to hear what it was all about. Overall it is very well produced, the guitar playing is very good, and to Pamela’s credit I do hear Bert Jansch in the picking. The songs, however, to me, are slightly somber, offering possible sadness, that leaves me with a somewhat lost feeling. This is no bad thing, however, it is not really my cup of tea. On the plus side, I hear resemblance to Pentangle here and there. I hear a definite Nick Drake in the string arrangements, and John Renbourne in the recorder moments. I also hear Robin Williamson in the poetry style on Fare-thee-forlorn. However, my favorite track happens to be a traditional arrangement of Cold blows the Wind, and not one of Pamela’s own compositions. This track, I find, is very well sung with a nice toned guitar accompaniment. It is emotional and shows Pamela’s passion for the music, as do her own compositions, and I must give credit where credit is due, and I have to say that it is a fine album, but as I have said before, I would choose to quench my folk thirst elsewhere. Probably, and without concern, in a jug of punch served by the McPeake Family, or a bowl of the steaming nut-brown meths, prepared by Rambling Syd Rumpo, the list is endless.